As one of the last remaining public sources of water without a covering, Capitol Hill gets to experience some of the nuts and bolts of maintaining a modern city water supply. Sometimes the Volunteer Park reservoir turns blue. Sometimes it lacks water. It’s one of those water lacking times again. Seattle Public Utilities tells us the reservoir has been emptied for a cleaning and should begin to be refilled Friday. Usually strictly an auxiliary source of Seattle drinking water, we learned after a chlorine incident this spring that the reservoir had been pressed into duty. 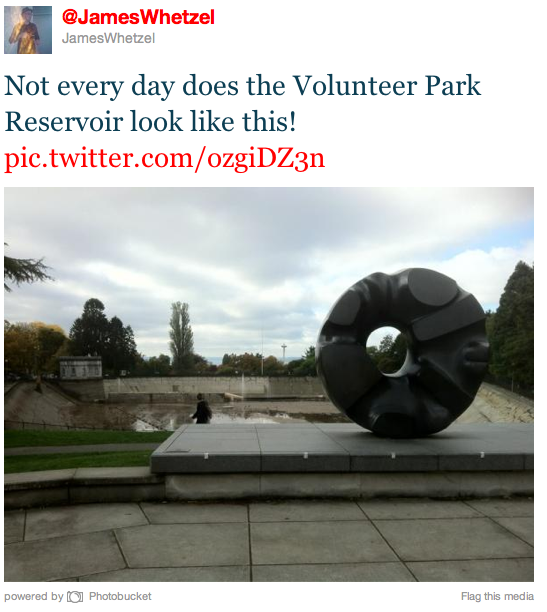 Like the body of water now beneath Cal Anderson, the Volunteer Park reservoir will inevitably be lidded. The recent efforts to establish the park as an official city landmark will help shape that work. But, in the meantime, it just needs 69 acre feet of water to be back in business.